Actually there are some fairly nuanced and well considered reasons for opposing the living wage that may surprise you – here are five of them. Please read with an open mind, consider carefully, and then leave us with a comment below. Less Jobs to Go Around! Living wage advocates tend to see the Minimum wage as a floor which can simply be raised by the law without any unintended consequences. However, minimum wage laws are actually more like the height of a hurdle which inexperienced or low-skilled workers have to jump over. A wage is not just an arbitrary figure: It’s a reflection of how much a person’s labour is worth to their employer, which is in turn a reflection of how much their labour is worth to the customer. To imagine we can just raise wage rates without any job losses is as irrational as setting the minimum price of a cup of coffee at £5 and expecting the amount of coffee people buy not to drop off. Minimum pricing laws on alcohol are based on this exact principle: that if we artificially raise the price of alcohol there will be less consumption. Even if there is not much shedding of already existing jobs due to labour laws, research points to the fact that raising minimum wages significantly lowers job growth over the long term. The government can set a price but it can’t force employers to hire anyone for that price. Even if there are some businesses that can absorb the cost, mum and dad businesses are likely to be the worst hit resulting in corporate takeovers by the big boys. The people who will be most negatively affected will be the young, the old, people who have left jail, immigrants, ethnic minorities, unskilled workers and other people whom an employer may discriminate against. The ability to work for less is their only competitive advantage against more skilled or experienced candidates. A better way to raise the income of low-earners is to cut taxes for people on low incomes. A Low-Rent Job is not For Life! Most workers are on higher pay than the minimum wage, and most people who are on the minimum wage do not stay on it for very long. Many young people who live with their parents or with their friends need work experience a lot more than they need a higher wage if they want to get better opportunities in the future. Since low-rent jobs are often boring and unpleasant (partly because they are unskilled) the main purpose of those jobs should not just be to get something on your CV, but more importantly to get some skills! Since a wage is a reflection of how much value a worker provides to their employer, in an ideal economy (a free market) there should be so many jobs that anyone can go into a low-paying job, learn all there is to learn about it in a couple of months, then move swiftly on to another one to learn more skills as soon as they get bored. Anyone who does this consistently can become a highly skilled person who can command a wage that is several times what the minimum wage is, or get a management or supervisory position, or better still create their own job or become an entrepreneur using the skills they have learned. Low-paid jobs are for learning new skills: not for life. And they should be plentiful. That way both the employer and the employee stand to gain because the work is of mutual benefit. If you have valuable skills that other people are willing to part with more money for you will never be out of a job, you will be in more fulfilling work as skilled work tends to be more engaging than unskilled work, you will be in control of your own destiny, and you will always be earning more than the living wage! I am not one of those people who believes the only purpose of education is to prepare anyone for the workplace – far from it, I am a devoted life-long learner – but the fact that people in this country spend 11-13 years in mandatory education and can come out with so few productive skills that no one will offer them £10/hr for their time is abominable! 11-13 years is long enough to become a concert pianist! More than enough time to become a doctor, lawyer, engineer, mechanic, plumber, electrician, carpenter, university professor, marketing executive, project coordinator, maths tutor, etc. … all professions that command far more than £10 an hour. We really need to look at our schools if we want to do away with low wages – intervening in the economy will only hurt those who are already poor, because a minimum wage job is better than no job at all! Minimum Wage Costs Don’t Come Out the Pockets of the People You Think They Do! There is a basic assumption that higher wages will come out the pockets of the rich, but that is a narrow and rather naïve view. Poor people tend to spend most of their income on cheap lower-end goods that involve the labour of minimum wage workers. Increasing the minimum wage will likely make these products more expensive, lowering the value of our pay checks even if it looks like we are being paid more. That will result in an increase in the cost of living, which will lead to an increase the living wage, which will lead to an increase to an increase in the cost of living, and so forth. 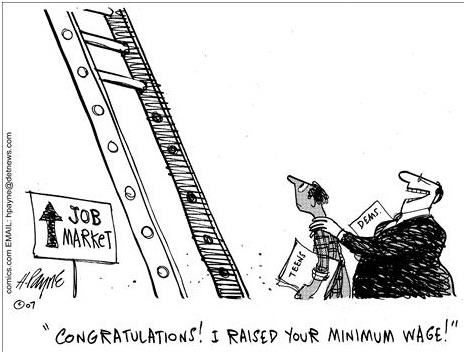 What needs to be considered is the accumulative effect of raising the minimum wage. The increase may not just affect the supermarket teller, but perhaps the workers that transported the goods to the supermarket, those who packaged them and stored them in the warehouse, secretaries and receptionist personnel along the line, and so forth. This might look great on the surface – so many people better paid! But each of those people are soon going to have to budget for price rises that may well exceed their gain. Because of this, a 30% increase in the minimum wage might well lead to a far greater increase than that in prices, especially once you factor in the increase in the cost of many of supplies that businesses require which will also be subject to increasing labour costs. It is when you add up the cumulative increase in costs that you understand how this might really put the squeeze on small businesses that can’t absorb those costs and will be squeezed out the market – in addition to putting a strain on disposable incomes. In fact the best way to make people more prosperous is not by increasing their wages, but by reducing the price of all the goods and services in the market. This is exactly what happened for the first one hundred years after the industrial revolution and we saw the greatest increase in people’s living standards in all of recorded history. It still happens in some sectors like computers and mobile phones, which is why these were luxury goods at first but now even people on low incomes can enjoy the benefits they provide. Business can also pass on the costs of minimum wage increases to staff in other ways; by reducing employee benefits, pensions, not paying for as many amenities in the work place, moving jobs abroad, etc. They can pass the cost onto their investors, making people less likely to invest in businesses and more likely to go into things like property. The additional demand will raise house prices and unfairly disadvantage first-time buyers as well as people who rent. Even if the rich do end up absorbing the cost of minimum-wage increases, there is no guarantee that that money wouldn’t have otherwise been spent on products that people would have been gainfully employed producing, or on capital investments which would grow the economy. Unintended consequences of well-intentioned minimum wage increases such as these would never even occur to most people simply because they require a fairly complex grasp of economics to intuit. Another one of these unintended consequences which is hard to detect comes under the fallacy of the seen and the unseen. It is easy to see the apparent benefits of a minimum wage increase to a worker getting a pay-rise, however, you may not even notice that a longer queue at the supermarket or your local coffee shop is a consequence. That’s two less jobs, and a poorer standard of customer service all across the country. In fact it’s impossible to guess how many goods, services and amenities we are going without due to minimum wage laws – but we can guess that those people on low incomes are also suffering these unmeasurable contractions in living standards. There is no shortage of work that needs doing but simply isn’t getting done because it isn’t worth paying the current minimum wage for. Perhaps teens could clean up the park at the weekend for a couple of quid – everyone would benefit – but that isn’t even legal. It’s not like hospital waiting lists are too short, or that there aren’t enough forests needing replanting, or that there’s too much care for the elderly or young… There is plenty of work but no one is doing it – and minimum wage laws plus over-regulation of labour markets are largely to blame. Less jobs in the economy is not just bad news for the unemployed – its bad news for workers too. In an economy were workers are climbing over each other to get access to a limited number of jobs they are in a weaker bargaining position. Employers don’t have to attract employees with good working conditions, flexible hours, friendly management, pensions, benefits, etc. People end up taking what they can get. There are too many laws making it hard to start a business or employ workers, and this affects people who need those jobs worse than capitalists. Ultimately a job agreement is a private arrangement between an employer and an employee that no one else has the right to interfere with. If you want to work for less than minimum wage to get your foot in the door, that’s your choice and no one has the right to take that away from you. Supposing I made a nice bangle and you wanted to get it off me for a couple of quid; that would make you – de facto – my employer; even in a limited sense. I am sure you would understand how crazy it would look if a government official came in through the window and put one or both of us in jail for it. The great thing about commerce is it leaves both participants better off than they would be if they had not traded. If we both agree to the exchange, then you consider yourself better off for having the bangle, and I consider myself better off for having a couple of quid. Naturally you don’t want to be forced to pay more for products or services than you are willing to: if you go into a bar where pints are £5.50 it’s your right to go around the corner to a cheap Spoons instead. Employers are no different. But they are not the only ones who profit from hiring someone to work for them. If you agree to take a job, clearly it’s because you think you’re getting something over and above what you’d be getting just working for yourself or someone else. Yes, you may just be taking it because there aren’t enough other jobs to go around, but as we’ve discussed that is not something the living wage is going to fix up for us. The fact is, your labour itself is actually of more value in the job than it is out of it – you yourself are profiting from the arrangement. Our labour is ours to dispose of as we please – and our wealth is ours to dispose of as we wish. Otherwise they can hardly be considered ours. We could apply price controls to everything: £10 a loaf of bread so the baker makes a fair deal, £6.50 minimum a hot chocolate. From now on people would only be buying luxury hot chocolates. Empires have fallen due to price controls because people just stopped making things that weren’t worth their time, or couldn’t fetch the price government officials set them at. I would like to see people on low incomes getting higher pay, who wouldn’t want that? But advocating The Living Wage as the means is simply putting ideology – however well-intentioned – before the facts. The libertarian case against the living wage is not heartless; it simply deals in practical terms with the economic facts of reality. If we want to increase the standard of living of people on low incomes we need to lower taxes for those on the bottom rungs of the job ladder. We also need to increase the number of jobs in the economy by removing as much red tape as possible surrounding starting a business and employing people so that the labour force is no longer such a buyers-market. We could institute voluntary minimum wage exemptions for initial training periods, but we also need to repeal any legislation against trade-unions in the private sector to preserve the rights of workers to engage in collective bargaining. We can also increase the standards of living of the poor by deregulating the housing market so that more homes can be built and the price of property and rent comes down. We also need to cut spending starting from the top by getting rid of corporate welfare and ending the wars (including the failed war on drugs) so we don’t have to print money to pay for them. Inflation makes everyone’s pay-check worth less (even if their wage increases) and hits the poor the hardest. There is lots that we can do, but instituting the living wage – however well-intentioned – will only be counter-productive because low incomes are only a symptom of a problem which needs to be tackled at its root. Antony Sammeroff: Is a writer and life Coach from Glasgow now living in Edinburgh. He is on The Scottish Libertarian Party’s Constitutional Committee. 1 Comment on "Living Wage : The Road to Hell… is paved with good intentions." Trackback from Why is the Capitalist Workplace so Authoritarian? - THE RATIONAL RISE ?